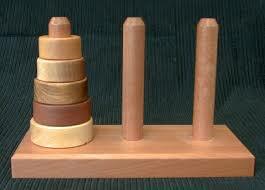 The Tower of Hanoi or Towers of Hanoi (also known as The Towers of Brahma) is a mathematical game or puzzle. It consists of three rods, and a number of disks of different sizes which can slide onto any rod. The puzzle starts with the disks neatly stacked in order of size on one rod, the smallest at the top, thus making a conical shape. This might be a simple game but it is a great tool to train your logic thinking. You can try it with different number of disks. They even added the challenge of completing the game in the minimum moves. Solution is also provided should you face challenges in completing! For those who are interested in the history of this games, read more here. I will be back in the next post to discuss on different approaches to a Additional Mathematics on Identity which falls in the topic of Factor Remainder Theorem. Look out for the next post!